Can you formula feed as per the baby’s weight? Do formula-fed babies feed less frequently than breastfed infants? 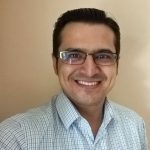 What are the signs that the baby is getting sufficient formula? What are the points to remember for formula feeding? Breastmilk is the best option for an infant. But in some cases, you may not be able to breastfeed due to several reasons such as health issues, unavailability or lack of breastmilk. 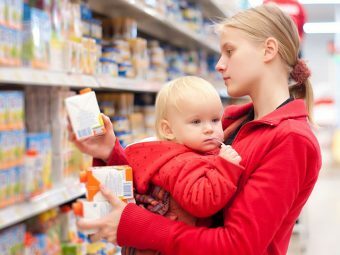 In such cases, you may give them formula milk as recommended by the pediatrician. Ideal amounts of formula should be given to the baby, at regular intervals, every day to ensure that he or she gets the required nourishment. But how much formula do babies need? Read this MomJunction post to find out about the quantity you should give and how often they should get it. The quantity of formula required by your baby depends on their age and weight. But do not start formula feeds before talking to a doctor, and only feed as per their recommendations. 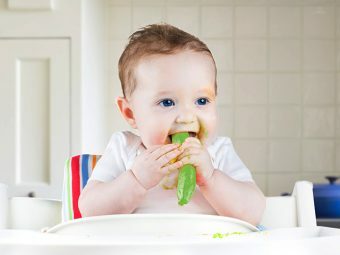 Note: The nutrition requirements of babies may vary, which will affect the number of feeds and their frequency per day. 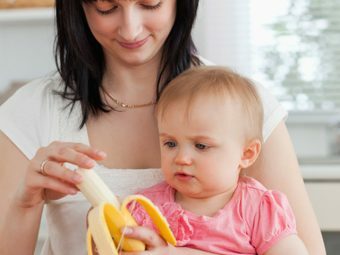 For specific quantities per feed, talk to the baby’s pediatrician. Can You Formula Feed The Baby As Per Their Weight? The age of the baby is the ideal determinant for the quantity of formula they need. However, the American Academy of Pediatrics recommends the amount of formula for babies based on body weight. According to the AAP, a baby needs 2.5oz (75ml) of formula in 24 hours, for every 1lb (453g) of their body weight (2). Yes. Breastfed infants take smaller but frequent feeds when compared to their formula-fed counterparts who tend to go longer between feeds (3). 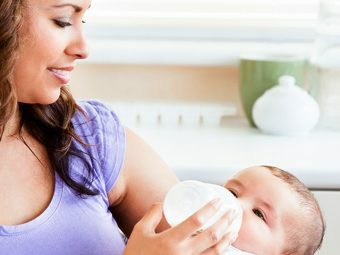 For the first few weeks after birth, a breastfeeding baby may feed every couple of hours while a formula-fed baby could have a gap of four hours because the formula takes longer than breast milk to digest, keeping the baby fuller for long, while the breastfed child becomes hungry sooner (4). How Do You Know That The Baby Is Getting Sufficient Formula? Timely bowel movement and urination: You will see soiled diapers at a set frequency, which suggests that the baby is eating enough. 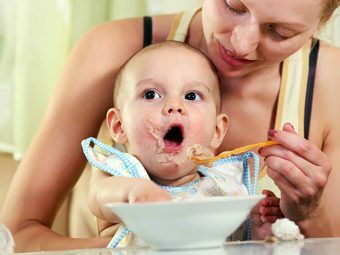 Is not cranky or fussy after the feed: A baby will get irritated and cry if they are still hungry. So if your baby is getting sufficient formula, then they will not be fussy after feeding. Sound sleep: A hungry baby will have a disturbed sleeping regime. If the baby is otherwise healthy but does not sleep properly, then it could be that his/her tummy is not full. Healthy growth: In the long term, a baby who gets sufficient formula will thrive and attain all the developmental milestones. Formula feeding is unlike breastfeeding and requires additional care to prevent under or over feeding. Each baby has different nutritional requirements. Not all babies of a particular age need the same amount of formula. Some babies may need less, and some may need more. So, feeding a baby on demand can be an ideal option. Do not force the baby to finish the bottle. It is okay if your baby leaves some formula in the bottle. Discard the leftover and make a fresh batch for the next feeding session. Unlike breastfeeding, where the baby only drinks as much as they need, formula-feeding runs the risk of overfeeding. Consult a doctor if the baby demands more than 32oz (946ml) a day. Pediatric experts state that a baby should not have more than 32oz (946ml) a day, until the age of 12 months. It is unlikely a baby will need more than the suggested quantity, but if the baby demands it, consult your doctor before proceeding. Formula feeding is convenient and lets the other members of the family look after the baby’s nourishment while providing the baby with essential nutrients. Do consult a pediatrician or a pediatric dietitian to determine the ideal quantity of formula for your baby. Eventually, the baby will move on to solid foods and be less dependent on formula for nutrition. When Babies Can Have Soy Milk? Why Is Calcium Important For Babies? Can You Feed Cerelac To 4 Month Old Baby?